Lennox Ashes Finally Arrive Home Or Did They? 22nd August 2012, Belfast City Council had publicly stated many weeks ago that they would post “some” of Lennox’s ashes home and today a courier delivered a plastic Russell’s Cellar’s off licence/liquor store bag back to the family. Inside the plastic bag was a partially torn package wrapped in brown packaging paper and within the paper was a cheap wooden box, no name plate, no blank name plate to have a name added at a later date. Lennox’s family weren’t even allowed a say in the choice of box for his supposed ashes. Lennox’s family have repeatedly asked Belfast City Council directly and through legal means for confirmation that the ashes are actually Lennox’s ashes or at very least some of his but as per usual Belfast City Council remain silent on the matter as they do with the continuous requests for Lennox’s collar, muzzle and lead. Belfast City Council have stated that they no longer have Lennox’s other items, why? why don’t Belfast City Council have these items, where did they go? Legally Belfast City Council had no right to do anything with Lennox’s other items other than send them home to his family. It seems suspicious that Belfast City Council wouldn’t allow the family to see Lennox one last time as they had promised in front of many people, it seems suspicious that Belfast City Council wouldn’t allow the family to see Lennox’s body after the council murdered him, it seems suspicious that Belfast City Council wouldn’t allow the family or someone else to pick up Lennox’s body and take him for cremation or to have a say in the process and it seems very suspicious that Lennox’s other items have now vanished from the possession of Belfast City Council, why? what state was Lennox’s body? What is Belfast City Council and their contracted kennel hiding? Who stole Lennox’s property? We won’t stop until these questions are answered and the items are returned. Lennox Wasn’t Humanely Euthanized, Innocent Lennox Was Murdered! 12th July 2012, It is with a sad and heavy heart we announce the murder of Lennox by Belfast City Council. Lennox was supposedly murdered on the morning of the 11th July 2012 however certain sources are now coming forward stating Lennox was murdered or found dead at the council contracted kennel many months before this date. The Lennox Campaign pledge and that of the family of Lennox is not to give up until Belfast City Council’s nasty secrets are revealed. To date Belfast City Council have refused to allow Lennox’s body to be returned home, refused his ashes to be returned and more recently have refused the repeated requests from the family for Lennox’s collar to be returned to the family’s Daughter as a keepsake. We will leave no stone unturned, we will reveal the truth about Belfast City Council, the council contracted kennel that held Lennox and all those involved in this evil case of cruelty and cover up! R.I.P Lennox, you are loved, you united so many around the globe, helped many others, forced a change in Northern Ireland legislation and will NEVER be forgotten. 13th June 2012, We would like to thank everyone for the countless messages that we have received in the last 24 hours during what is a very difficult time for our family and for the support we have had from so many since Lennox was seized in 2010. The past two years have been extremely distressing for many reasons and we appreciate that this has been a very emotive case for dog lovers worldwide who have spoken out against the failings of Breed Specific Legislation. We take some comfort in the knowledge that we are not the only ones to be devastated by the recent ruling. We are in talks with our legal team and will make another statement in due course. Thank you. 12th June 2012, Lennox’s Family Will Release A Statement In Due Course Once They Have Had Time To Absorb Today’s Ruling By Chief Justice Girvan. The Family Kindly Ask All Supporters To Remain Calm And Dignified As Always In Their Response To Today’s Sad And Very Wrong Decision By The Northern Ireland Chief Justice. Thank You. 17th May 2012, To mark Lennox’s second year in cruel captivity at the hands of Belfast City Council the Save Lennox Campaign is asking every supporter to take part in a special 72 hour Twitter & Facebook campaign called ‘Each One, Reach One’ The aim being each Lennox Supporter, Anti BSL Campaigner and Animal Right’s Activist unite and reach one other person who may not already know about Lennox, Dangerous Dog’s Act or Breed Specific Legislation and to make that person aware of Lennox’s story and the cruelty of Breed Specific Legislation that is responsible for the deaths of thousands of innocent and loved family pets each year. The Save Lennox Campaign posted recently on the official Save Lennox Facebook page saying “This event is to again highlight the urgency for a repeal of BSL. BSL hasn’t protected the public, it’s failed, the wrong dogs and people are being punished and the public certainly haven’t been protected as attacks continue to rise. The Each One Reach One event isn’t just for Lennox, it’s for every BSL victim past, present and sadly future unless everyone, everywhere takes a stand against this evil legislation and speaks out now before their innocent family pet is next, there’s no point crying about it when it happens to you when they could have acted now and stood up against BSL which is why we hope everyone in all timezones will take part over the three day event” More information on the event that is being hosted on social networks Twitter and Facebook beginning on Friday 18th May at midnight and continues through to Sunday 20th May can be found on this site or by visiting the official Save Lennox Facebook page. 10th May 2012, America’s largest online news provider the Huffington Post today published Lennox’s story further increasing the global knowledge of Lennox’s plight and the actions of Belfast City Council throughout Lennox’s legal battle. The article written by columnist Joan Smith touches on many subjects including Northern Ireland’s justice system, the UK’s Dangerous Dog Act, experts Victoria Stilwell and Sarah Fisher, Belfast City Council’s contracted dog handler Peter Tallack and the wrongly addressed warrant produced on the day of seizure of Lennox by Belfast City Council. 8th May 2012, Users of social network Twitter often use the Follow Friday hashtag as a way to recommend and thank fellow Twitter users on Friday’s however the use of hashtags are also a superb means of advertisement for various businesses, groups and campaigns. On a weekly basis the FollowFriday.com website counts Twitter usage of the Follow Friday hashtag and awards each global Twitter user a ranking according to how many times individual Twitter users have used their particular hashtag thus calculating the ranking and reach for a hashtag. In a recent calculation the FollowFriday.com website calculated the #SaveLennox hashtag usage and ranked Lennox 4,049 from 21,558,090 in a global user ranking. Although these rankings change each week this recent calculation further proves that Lennox’s story is reaching a larger global audience demonstrating just how many people around the world are aware of Lennox’s plight, care for Lennox and support his fight for life whilst Belfast City Council pursue their case to have innocent Lennox murdered further damaging their own reputation and unfortunately that of Northern Ireland. The Save Lennox Campaign would like to thank all global supporters for their continued support and ongoing campaigning to make more people aware of Lennox’s fight for life. 21st April 2012, On May 24th both legal teams are scheduled to put forward their evidence in a brief hearing to allow the Northern Ireland courts service to make a decision whether Lennox’s case should be allowed to further progress. Any further updates will be available in the coming weeks from the official Save Lennox Campaign website. 31st March 2012, In the October 2011 episode of the new season, Victoria and Holly discuss what they’ve been up to for the past several months, including Victoria’s filming of the 8th season of It’s Me or the Dog, experiencing the recent earthquake and hurricane, Victoria on Anderson Cooper, the Hero Dog Awards, Holly’s judging of Miss Tennessee, her dog Kashmir’s knee surgery, and Victoria’s development of her new Canine Noise Phobia series of desensitization products. Also discussed, Victoria’s upcoming trip to San Diego for a dog training conference and pet expo, her upcoming live tour dates, Holly’s work as a correspondent for CNN, and the new podcast sponsor, Pets Add Life. The hot topic was the case of Lennox, a pit bull type dog in Belfast who is scheduled to be euthanized due to Northern Ireland’s antiquated breed specific legislation (BSL). 28th March 2012, The globally followed and supported Save Lennox Campaign again waits for some kind of decision to the fate of innocent Lennox. Although no definite date had been confirmed by Northern Ireland courts service it is known however on March 30th Lennox’s case will be reviewed by the High Court during which Lennox’s legal team hope to be granted an appeal hearing and a date for such to be set during which another request for Lennox to be exported out of Northern Ireland will again be put forward should Lennox not to be granted his deserved freedom. April 1st sees Lennox’s 7th birthday which will be his second birthday in Belfast City Council’s captivity, to mark the occasion the Save Lennox Campaign and campaigners plan to unite on Facebook and Twitter for a special Save Lennox tweetstorm to again highlight the evil wrongs of breed specific legislation around the globe and to once again share Lennox’s plight and suffering at the hands of Belfast City Council. You can join in with the Twitter tweetstorm on April 1st at 21.00 (9pm UK) using hash tag #SaveLennox or visit the Save Lennox Campaign Facebook page. 23rd January 2012, On January 13th 2012 Judge Rodgers updated his verdict and upheld his original ruling that innocent family pet Lennox must be put to death due to how he looks. Although Judge Rodgers reportedly made all parties aware of his latest decision on January 13th the family of Lennox however were not made aware of this latest decision until it had been published in a local newspaper which included a shocking and very hurtful title by the reporter. Judge Rodgers who reviewed his own previous verdict which included a death sentence passed down to innocent Lennox in September 2011 came about his recent decision claiming Lennox’s legal team did not establish any adequate point of law within his previous handling of the case. Many supporters have since cried out in anger questioning the courts as to why a Judge who passes a death sentence can review his own original judgement as it is pretty obvious the same judge would find he had made no mistake by not exercising all options put before him which included moving Lennox outside of the UK, nonetheless these questioning calls seem to have fallen on deaf ears as it seems perfectly normal for a Northern Ireland county court judge to review his own case. Another appeal has been submitted by Lennox�s legal team in response to Judge Rodgers Jan 13th ruling. 22nd December 2011, As innocent Lennox spends yet another Christmas away from his family locked up in a cold concrete cell with saw dust covered floor his family and hundreds of thousands of global supporters, campaigners and celebrities wait patiently for news of whether the Northern Ireland judicial system will grant another appeal and this time actually listen to real experts other than those over paid to say what they have been told to say and who are clearly not experts in any sense. Judge Rodgers took time to consider whether another appeal should or should not be given to Lennox after Lennox�s legal team lodged points of law with the Northern Ireland courts stating various points where Judge Rodgers may have failed to exercise all options put before him before he handed down his death sentence to gentle Lennox after he heard three varying and totally different statements from three council employees at Lennox�s final appeal hearing back in September. Many of Lennox�s supporters and his family thought that the courts may have given their decision before Christmas but as the new year approaches it now looks unlikely there will be any news from the courts regarding an appeal decision, the next news from the courts is now expected in the first part of the new year. Many people believe that the case against Lennox and his family is now out of the hands of Belfast City Council when in actual fact Belfast City Council could drop their case against gentle Lennox and his family at any time therefore ending the courts sentencing and prosecution of a much loved family pet and his disabled twelve year old owner. However Belfast City Council seem determine to waste tax payers money which is now well into tens of thousands spent attempting to make a point out of Lennox, score points against Lennox�s family for speaking out against Belfast City Council. It has been known for some time now that Belfast City Council�s vendetta and witch hunt has indeed very little to do with Lennox now and everything to do with punishing Lennox�s family, supporters and anyone who dares to stand up and speak out against Belfast City Council. In the meantime the world watches and waits for some news or a sensible decision to be made in the beginning of 2012. 1st December 2011, As this is the second Christmas that innocent Lennox is spending separated from his family the Save Lennox Campaign in conjunction with DDA Watch are announcing the launch of the Save Lennox Christmas Campaign which includes a new single dedicated to Lennox released by Maria Daines and Paul Killington entitled �Jingle Bells for Lennox� The Christmas Campaign aims to highlight his story and keep Lennox�s fight for life fresh in the thoughts of everyone over the Christmas period and also allow people to spare a thought for all those other innocent dogs past and present who find themselves victims of the unjust BSL. 30th November 2011, A new rendition of the traditional Christmas song �Jingle Bells� has been released online today as part of an ongoing appeal to save the life of a family dog currently incarcerated by Belfast City Council Dog Control Department. Lennox�s family and supporters hope the song �Jingle Bells for Lennox� will highlight their Christmas campaign and keep Lennox in hearts and minds through the holiday season and beyond. The campaign includes an appeal for the public to remember abandoned and unwanted pets and to consider sending a gift to a rescue shelter for dogs and cats in need. 10th November 2011, It has been revealed that one or more Belfast City Council dog wardens involved in the seizure of Lennox from his home in May 2010 has been using fake Facebook accounts to leak court documents and clips of evidence videos that were originally unsigned by court for public release. The documents and videos began appearing on Facebook posted from the fake accounts seemingly in an attempt to portray Lennox, his Family, supporters, those involved in his legal campaign in a bad light but in an evil twist hurtful comments were also posted by some of the warden�s supporters regarding Lennox’s owners Daughter. The revelation came when one of the wardens own minority supporters noticed that a personal mobile telephone number, name and location on a Facebook account was identical to a past advertisement made by the very same dog warden seeking a suitable dog for agility training. Upon noticing the error that had been made the dog warden Family member then published a statement on Facebook admitting what they had done and even tried explaining their actions which to all reading seemed to be a statement of damage control. 5th October 2011, Vet Pete Wedderburn speaks about Lennox, Belfast City Council, BSL and the recent introduction of BSL to Australia on Ireland’s TV3 morning programme. If you are unable to receive the TV3 channel then click on the title link above to watch the online version of the programme. 30th September 2011, As most will now have heard Lennox’s Family lost the appeal hearing to spare his life. Judge Derek Rodgers based his decision on two lies told by a certain Belfast City Council dog warden who also committed perjury in a previous hearing. Lennox’s Family have been granted a 14 day window to again appeal the Judge�s decision. It is now widely known and thought that this case is not only flawed but many celebrities, qualified expert dog behaviourists, dog trainers and those within a legal arena have also stated that the case is less or nothing to do with Lennox but seems to be a political judgement on the Family for speaking out. How else can a non dog behaviourist and three dog wardens who all gave differing statements are rewarded by a Judge especially as their evidence has been proven wrong by actual experts. People need to begin reading between the lines and asking questions as this recent outcome does not only affect Lennox but all dog owners of all breeds. 19th September 2011, Due to the court running out of time to hear all evidence regarding Lennox’s case the final part of the appeal hearing will be held this Friday 23rd September when both Lennox’s expert Sarah Fisher and the Belfast City Council’s expert Peter Tallack will present their evidence. In the first part of the appeal hearing those who attended court heard evidence given by three Belfast City Council dog wardens all of which differed in many details again showing that the Belfast City Council dog wardens involved cannot completely be trusted to provide accurate and truthful accounts of Lennox or their involvement in his seizure. 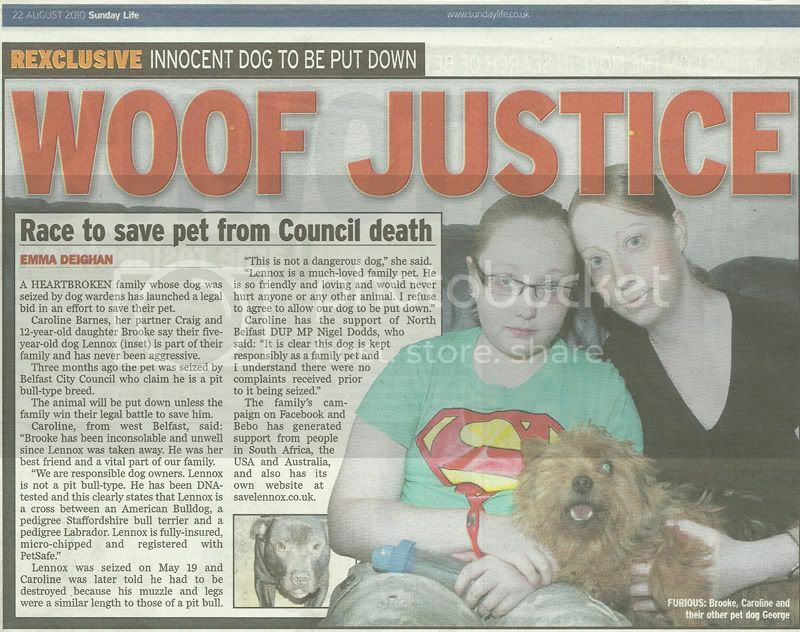 13th September 2011, Today the Daily Mirror newspaper printed another article covering the damning evidence that Belfast City Council and Council employed dog wardens involved in Lennox’s seizure gave false or misleading evidence in a previous court hearing. Click on the above title to read the full story including the Daily Mirror article. 9th September 2011, During the last Court hearing a Belfast City Council dog warden involved in Lennox’s seizure told Judge Ken Nixon under oath that Lennox was aggressive and she continued to tell the court in her evidence that she doesn’t go near Lennox for fear of her own safety. The latest article added to this site proves this dog warden committed an act of perjury. Read the full article by clicking on the above title. 22nd July 2011, Celebrity dog trainer and presenter of hit TV show �It�s Me Or The Dog� has joined ranks with many hundreds of thousands of worldwide supporters and celebrities calling for the release of Lennox and the repeal of BSL. Victoria Stilwell joins an ever growing list of celebrities showing support for Lennox on Twitter and Facebook speaking out not just for Lennox but all victims of BSL. Many celebrities have reported directly messaging Belfast City Council making them aware that the eyes of the world is upon them however many have reported being ignored or blocked by Belfast City Council from various other means such as Twitter and Facebook. 13th July 2011, Today the Save Lennox Campaign has been made aware that Lennox’s case will be in court again on the 16th September for the long awaited court appeal of Lennox’s destruction order which was previously passed down by district Judge Ken Nixon at the last court hearing. After the Save Lennox Campaign ran a poll for a one week period on this site asking people if they felt Judge Nixon had allowed all the actual case related facts from Lennox’s legal team to be heard and if Judge Nixon had made the correct decision 2,455 total votes were logged, 97% (2,391 votes) agreed that Judge Nixon did not allow all the facts to be heard from Lennox’s legal team and only 3% (64 votes) felt Judge Nixon was correct in his decision ordering Lennox to be destroyed. Shortly after the poll had expired many supporters who attended the previous court hearing contacted the Save Lennox Campaign stating that Judge Nixon quite happily sided with Belfast City Council as he had clearly made his decision in favour of Belfast City Council only minutes into the hearing. 7th March 2011, Everyone has now heard the great news that MTV is hosting the 2011 European Music Awards in Belfast this November but we ask do MTV know that they are openly supporting animal cruelty by associating themselves with Belfast City Council to host this event? Surely MTV and MTV Europe don’t want their good name tarnished by working so closely with those who believe animal cruelty is right? Shame on MTV. 7th March 2011, On the 3rd March Karishmeh Felfeli interviewed Lennox’s owner on Offbeat Radio broadcasting from Dublin City Radio 103.2fm. This is a follow up broadcast from the one hour special show dedicated to Lennox and broadcasted in November 2010. Click on the link title above to listen to the latest interview. 2nd February 2011, On Sunday 6th February 2011 The Save Lennox Campaign will be holding an eBay auction to raise additional funding for Lennox’s behaviourist. The item for auction will be Brooke’s original artwork entitled ‘Brooke’s Plea’. As many of you will know by now ‘Brooke’s Plea’ has been published in many newspapers, magazines and featured on many forums and websites around the globe. To view the live auction simply click this articles title above. 19th January 2011, Read the supporter submitted blog about Lennox and BSL written by Mick Clark at the Save Lennox Campaign Blog. 19th January 2011, The February court date has been moved to March 29th at 10.30am Belfast Laganside Courts. You can use the link by clicking this articles title above to check the court schedule 7 days prior to court hearing. 8th December 2010, Despite the best efforts of a certain Northern Ireland body to have the Save Lennox Campaign silenced by reporting and removing the campaign Facebook page the Save Lennox Campaign are back with a brand new Facebook page and new URL. To visit the new Facebook Fan page click the Facebook link above, then the Facebook logo. Obviously these attempts by that particular group prove they are afraid of the Save Lennox Campaign and will yet again stoop lower than low, try every dirty tactic and trick to silence the truth of their errors and mistakes getting out to the public. Note to BCC: You can’t keep a good dog down, we won’t be silenced! 19th November 2010, The Mirror Newspaper was granted exclusive permission to spend time with Lennox’s owner, a little girl hurting in more ways than one due to Belfast City Council’s evil and heartless actions. 17th November 2010, The Belfast Telegraph Newspaper publish a third article about Lennox and ask why Belfast City Council use him as an easy target. 15th November 2010, The Belfast Telegraph Newspaper yet again publish a second article about Lennox and his fight for life. 9th November 2010, Offbeat Radio 103.2FM broadcasting from Dublin will be dedicating a one hour special show to the Save Lennox Campaign this coming Saturday 13th Nov from 9PM. Offbeat Radio hosted by Karishmeh Felfeli will broadcast Lennox’s story and also hopes to raise further awareness of BSL. Tune in to Offbeat 103.2FM this Saturday from 9PM to show your support. 20th October 2010, PoliticsNI website has exclusively revealed the Lennox related documents that Belfast City Council don’t want the public to see. The website has published the incorrect addressed warrant of seizure, the cease and desist order from the American Dog Breeders Association (ADBA) issued to Belfast City Council for their illegal and unauthorised use of the ADBA breed standards guide used to seize Lennox and still used by Council Dog Wardens to seize family dogs across Belfast, a standard response from Belfast City Council and the very latest picture of Lennox being kept in an inhumane concrete prison without any signs of water being supplied, toys or proper bedding. Shocking display of how Belfast City Council Dog Wardens claim to practice humane animal welfare as boasted on the Council’s website. 20th October 2010, Hundreds of thousands of Lennox supporters and campaigners from across the globe came out in force and posted messages of support for Lennox on Belfast City Councils Facebook page today. The Belfast City Council Facebook page clearly states that the Council welcome the public’s comments however every single message related to Lennox has now been deleted. Obviously the Council aren’t strong believers in freedom of speech and clearly demonstrated this by deleting all Lennox related comments from the Council’s Facebook page. 20th October 2010, Dog Cast Radio an online website and twice monthly dog related podcast have shown support for Lennox by posting Lennox’s story on the Dog Cast Radio website with future plans to cover Lennox’s story on an upcoming Dog Cast Radio podcast. Dog Cast Radio podcasts can be subscribed to and downloaded from iTunes in various formats. 18th October 2010, Total Oblivion Radio an online radio station today gave support to the Save Lennox Campaign by raising awareness of BSL and Lennox’s plight. The station dedicated a two hour slot broadcasting to thousands of listeners across the globe helping raise awareness of Lennox and all victims of BSL and have also published Lennox links to their website. 29th September 2010, After many months of waiting and date changes Lennox’s case will now be heard at Laganside Courts on 23rd Novemeber 2010. Hopefully Belfast Courts will see sense and release Lennox who was illegally seized by Belfast City Council back to his family. Belfast City Council Dog Wardens Use Incorrect Warrant Of Seizure – Major Blunder Again By Belfast City Council Dog Wardens! 8th September 2010, On the day Belfast City Council seized innocent Lennox they produced a warrant of seizure, the warrant Belfast City Council Dog Wardens produced was not only the wrong type of warrant for a seizure but also for another address at another part of Belfast. In actual fact Belfast City Council removed Lennox illegally… They stole him! Instead of admitting they have made yet another major blunder in this case and returning Lennox to his home Belfast City Council have instead decided to throw vast amounts of cash at this case by flying so called dog breed experts from mainland UK in with an aid to secure a death sentence for Lennox and hopefully by winning their case Belfast City Council Dog Wardens department can cover up the major continuous errors and lies they have made and told regarding Lennox’s case. 7th September 2010, While poor Lennox remains locked up in unsuitable undisclosed conditions with unsuitable kennel staff and without proper human stimulation Belfast City Council again need further time to get their stories straight and so have asked for a court date extension. Lennox’s next hearing has been set for the 21st September. 22nd August 2010, The Sunday Life Newspaper has today published the story of Lennox and how he was wrongfully seized by evil Belfast City Council Dog Wardens and remains at undisclosed kennels. 13th August 2010, The kind supporters at Bruces Rescue Group have setup a “Light A Candle” page in support of Lennox, now all Lennox’s global supporters can light a candle and leave a message. 10th August 2010, Today was the first hearing regarding Lennox at Belfast Courts. Nothing really happened to report about as this hearing was only to set a date for the main hearing. Took about an hour for the second Court hearing date to be set for 7th September 2010. Whilst at court we had a chance to read over the statements made by the Belfast City Council staff who seized Lennox from his loving home and to be honest we never read one truthful word in any of the four statements that we seen, we really did not think Belfast City Council would stoup so damn low to secure a death sentence on a poor little girls innocent pet. 7th July 2010, Sue McCabe, dog trainer and founder of Muttamorphosis publishes a beautiful article about Lennox’s story on her online Dog Blog. 6th July 2010, We are currently working on a new campaign video and would like to feature as many as possible of Lennox’s Friends and Supporters from around the world in the new campaign video. If you would like to be featured then please click on the title link for more information. 3rd July 2010, K9 Magazine today published a very moving and beautiful article written by Maria Daines to raise awareness of Lennox’s fight for life and the continuing failures of BSL around the globe. 1st July 2010, International, multi award winning singer and songwriter Maria Daines and Husband Paul Killington have written, produced and released a song especially for Lennox. Our sincere thanks to both of them for this beautiful song; we are honoured for this gift. Please click the title link above to download the Lennox song. 29th June 2010, Supporters and followers can now download the Save Lennox Campaign flyer and help spread the word about Lennox and all victims of BSL legislation. Click on the article title above. 28th June 2010, Registered forum members can now download one of three free iPhone wallpapers to proudly display on their iPhone to help spread the word and show support for the Save Lennox Campaign. 28th June 2010, International, multi award winning singer and songwriter Maria Daines has released a new CD album in aid of raising funds for Bull Breed Rescue and to raise awareness of issues affecting bull breed dogs within UK. 25th June 2010, The Belfast Telegraph Newspaper has today published the story of Lennox and how he was wrongfully seized by evil Belfast City Council Dog Wardens and remains at undisclosed kennels. 25th June 2010, North Belfast MP Nigel Dodds stated today in Belfast Telegraph interview that he is “Appalled” by Belfast City Council Dog Warden seizure of Lennox and calls for a review of Council policy. 24th June 2010, International, multi award winning singer and songwriter Maria Daines and her Husband Paul show support for Save Lennox Campaign and posts new Save Lennox Campaign video to the Maria Daines official website. 24th June 2010, Today saw the launch of the Save Lennox Campaign Channel on YouTube. The channel aims to bring the story of Lennox and many other BSL victims stories to the publics attention. Click the blue title link above to view channel and please subscribe. 24th June 2010, NARA (The National Animal Rights Association) Have kindly offered support for the Save Lennox Campaign and will be managing an information and petition signing table at Belfast City Hall from 1pm Saturday 26th June. Stop by, sign the petition and help end BSL.